James Robert Evans was born in New York, NY., on the 12th September 1845 and died on the 27th December 1918. His father was a Canadian, his mother a New Yorker. James entered service at New York, N.Y. as a Musician on 30th June, 1861 enlisting in Co. F. 62nd NYSV. He was transferred to Company H the same day. He gave his birth date as 1843. He fought at, amongst other battles, Fair Oaks, The Seven Days battles at Malvern Hill, Second Bull Run, Antietam, Fredericksburg, Gettysburg, Spotsylvania and the Wilderness. James R. Evans was a Congressional Medal of Honor (CMOH) recipient. He was awarded the CMOH for his bravery as the Battle of the Wilderness, Virginia on May 5, 1864. His citation reads "Went out in front of the line under a fierce fire and, in the face of the rapidly advancing enemy, rescued the regimental flag with which the color bearer had fallen". In a further act of heroism, he later entered the enemy lines and brought back information which saved the regiment from "probable annihilation". He seems to have received a promotion to Captain after this action. His Medal of Honor was awarded to him on February 25, 1895. James R. Evans was also a recipient of the New York State Medal (presented to New Yorkers who fought at Gettysburg), the medal awarded to members of the Anderson Zouaves by their regimental commander and "another one won for gallantry in action". James mustered out on 29th June, 1864 at Petersburg, VA.
At the end of the War he returned to Jersey City and married Julia A. Kinsley and moved to Pompton Plains in 1875, where he kept the general store. “A few years ago Daniel A. Gormley of this place found thieves in his chicken coop and shot one of them and kept him prisoner and went for J.R. Evans, who was constable at the time. Constable Evans responded quickly and at the point of his pistol alone marched his three prisoners before Squire John Shipoe. The people, finding out what kind of stuff Evans is made of, did not hesitate to make him their candidate for Justice of the Peace, and how creditably he has served in that capacity many of our citizens can bear witness”. Post-war, James R. Evans was a member of the John E. Beam Post #92 G.A.R. of Bloomingdale, NJ. (The Union veterans' organisation). He was at one stage the Post Commander. According to US Census documents, James had two sons: Isaac L. Evans, (born c. 1872 and who in 1919, was Vice-President of the Caldwell National Bank and the Lane & Lockward Company also of Caldwell, NJ). His other son was James R. Evans Jr., an official of the American Railroad Express Company. He also had a brother, Alfred G. Evans, of Madison. The 1880 Census states his wife, Julia A. Evans was aged 28 and mentions two daughters, Ella (born c. 1875) and Ettie, (born c. 1877). James R. Evans was a resident of Pequannock for over 25 years. He was one time owner of the now historic "Martin Berry House" in Pompton Plains NJ. He was also a member of the Board of Education of School District #105. For ten years he kept the store at Pompton Plains. James R. Evans was responsible for setting a telegraph line that connected to his house, which opened the town up for electronic communications with the outside world. In addition, he served as the Railroad agent for the Erie Railroad - Greenwood Lake Division for 26 years (1876-1902) at the Pompton Plains RR station, where he also served as Postmaster. In 1902 he went to Port Hope, Canada, to take care of a large property left by a relative. James was a member of the Episcopal Church in Port Hope, Canada. James R. Evans died at home, in Hanford Place, Caldwell, N.J. of "acute indigestion". After a "hearty meal" he complained of "pains in his heart" and died a few minutes later. His funeral service was conducted at his home by Rev. David N. Kirkby of St. Peter's Episcopal Church, Essex Fells. By order of the War Department a squad of sailors from the local rifle range acted as bearers and fired three volleys at the graveside. James R. Evans is buried in the cemetery of the First Reformed Church of Pompton Plains, Pompton Plains, NJ., Plot 202, Section Map 3. His gravestone markings read; EVANS Capt. James R. Evans and Julia A. Kinsley. 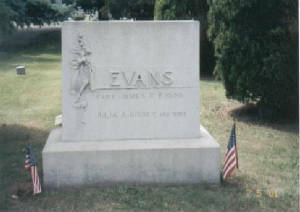 In 2004, the Pequannock Township Historic District Commission arranged to have a US Government issued gravestone erected over James R. Evans' grave. This effort was assisted by American Legion Posts 242 (Pompton Plains) and 450 (Pequannock), Pequannock Valley Rotary, the Robert L. Gitin family and the Donald W. La Palme family. The dedication of this new gravestone was held on 6th November, 2004. Today there is an Evans Street named after him and a cornerstone by the post office that also bears his name. Many thanks to Mr. Ed Engelbart, Councillor of the Township of Pequannock for supplying the bulk of this biographical information. Caprio., G.T. (2004). Medal of Honor Veteran's Monument Dedication. Pequannock Township Historic District Commission. Press Release. Pompton Plains, N.J. Brock., C. (2004). 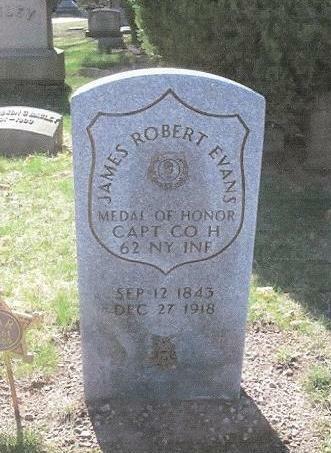 James R. Evans Civil War Hero - NY. Dodge., R. (2002). Biography of James Robert Evans. Engelbart., E.G. (2006). The American Civil War and "Old Pequannock" Township. Pequannock Township District Commission. Pamphlet. Pequannoc, N.J.
MacAvoy, B. (2003). James Robert Evans. Myers., G. (2004). Town Honors Civil War Veteran. Suburban Trends, Wednesday 10th November., p.1. Pequannock, N.J. Port Hope Evening Guide. (1919). Obituary: James R. Evans. Thursday, 2nd January. Port Hope, Canada. The Argus. (1898). James R. Evans for Freeholder. Friday 4th March. Butler, N.J. The Caldwell Progress. (1919). Buried With Military Honors. Saturday, 4th January. Caldwell, N.J. Wilhelm., R. (2004). John E. Beam #92 G.A.R. Bloomingdale, New Jersey: Membership Roster. Wisneski, D. (2004). In Honor of James R. Evans.